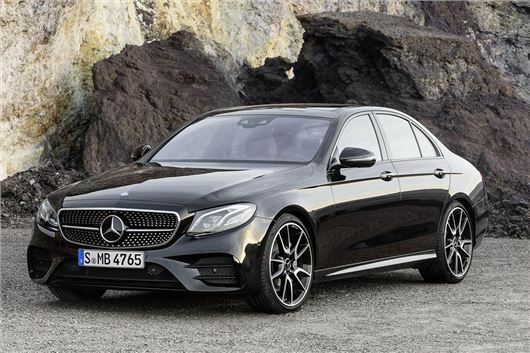 Mercedes-Benz has announced the first high-performance variant of the all-new E-Class. The E 43 AMG 4Matic is powered by twin-turbo V6 producing 401PS and 520Nm of torque. Transmission is a four-wheel drive 9G-Tronic automatic. Sales should start in the summer and we expect it to cost around £60,000. 0-62mph takes 4.6 seconds and top speed is limited to 155mph, yet emissions are surprisingly low at 189g/km – though fuel economy isn’t particularly impressive 28.3mpg. The nine-speed transmission has several shift modes and can be set to manual, should the driver want to take control. The four-wheel drive system has a rear-drive bias of 31/69 per cent, to give the enjoyable feel of a rear-wheel drive car but with safer cornering and acceleration. There air suspension has three settings – Comfort, Sport and Sport Plus, so drivers can choose between relaxed long distance comfort or a firmer ride for spirited driving. Inside the E 43 AMG has sports seats trimmed in a mix of Artico artificial leather and cloth, featuring red stitching. There is also a unique instrument cluster with extra functions including a lap timer. Outside there are 19-inch wheels and AMG styling, including quad exhaust pipes and more aggressive bumper designs.